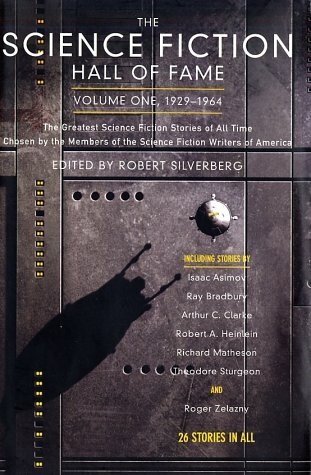 The book you now hold contains twenty-six of the greatest science fiction stories ever written. They represent the considered verdict of the Science Fiction Writers of America, those who have shaped the genre and who know, more intimately than anyone else, what the criteria for excellence in the field should be. The authors chosen for The Science Fiction of Hall Fame are the men and women who have shaped the body and heart of modern science fiction; their brilliantly imaginative creations continue to inspire and astound new generations of writers and fans. Robert Heinlein in "The Roads Must Roll" describes an industrial civilization of the future caught up in the deadly flaws of its own complexity. "Country of the Kind," by Damon Knight, is a frightening portrayal of biological mutation. "Nightfall," by Isaac Asimov, one of the greatest stories in the science fiction field, imagines a planet where the sun sets only once every millennium and is a chilling study in mass psychology. Originally published in 1970 to honor those writers and their stories that had come before the institution of the Nebula Awards, The Science Fiction Hall of Fame, Volume I, was the book that introduced tens of thousands of young readers to the wonders of science fiction. Too long unavailable, this new edition will treasured by science fiction fans everywhere.